This is what Kanikapila is all about! EKK Kauai 2013. This is what Kanikapila is all about! That was the comment that came my way all evening long as the Fabulous Four Kumu Hula of Kaua’i took to the stage in front of a record crowd of over 500 party animals for EKK Monday. What do you expect when you are able to corral four consummate party planners under one roof from their busy schedule of prancing all over the world sharing the aloha of Hawaiian music and dance to their loyal haumana in many different countries. We asked for a pardee and a pardee we got as they put the audience through the interactive paces of singing, dancing, and laughing all night long to their verbal antics, their hilarious family-style bantering, their explosive personalities, their incredible combined talents and their truly genuine style of creating the aloha atmosphere. Stand up! Sit down! Turn left and ask for peanut butter cookies, sing along, clap, dance the hula, play the ukulele, sing along again…whatever they asked the audience did. It was just like being at a backyard party at Nathan Kalama’s home except that it was a huge crowd in the ballroom at Kaua’i Beach Resort. What fun! On behalf of the four of us, Hui O Kalamaola, I would like to express our aloha and gratitude for the opportunity for us to celebrate in the 30th year of EKK.,,,”Kaua’i Style”. Somehow, despite us not being able to meet discuss and rehearse, it all seemed to have worked out….whew. Personally, I was nervous for 3 days before the event and was dressed 2 hours before pick up…needed some quiet time to breathe deeply and get my nerves under control. 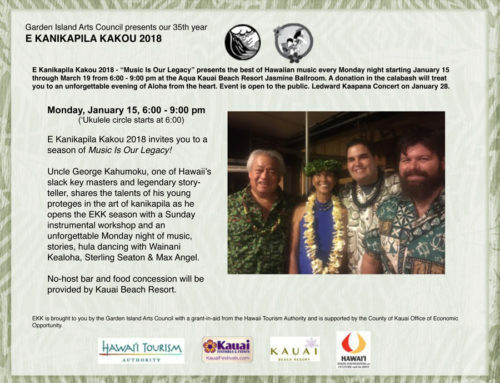 Somehow when the evening began at 6pm, I could feel the energy rising in the room and it gave positive and powerful fuel to the four of us…this was going to be a “Kaua’i Kakou” evening. As the audience embraced us, it became easier to share as we “connected”…it was wonderfully magical” for us. One of the thrill and highlight of the evening for us was to recognize all Kaua’i kumu hula and their haumana and see them dance together….”Kaua’i Style.” One of several magical moments of the evening. Another thrill was to see so many local people come to support the program that evening…and also the total amount that attended…that was a mindblower for us…all due to your excellent advertising.!! Mahalo nui loa. Congratulations once again on the success of EKK…what an accomplishment…done in the true “Kaua’i Style”. One does not reach “thirty years” every year so when you do, it is time to celebrate and that is exactly what the four Kaua’i Kumu Hula did with all their combined energies, their wonderful and talented friends and haumana; the audience of old and the audience of new were loving it even when they had to stand for lack of chairs or sit on the floor to get closer to all the action. Nathan opens with “We don’t know what we are going to do” in a voice that was quiet and almost faint. But as he began to feel the electric vibes of the hungry-for-a-pardee audience, almost like a switch was turned on, Nathan came alive and started the ball rolling as only Nathan can. You can tell when he’s “on” because he starts ordering people around…and the funny part is that everybody loves it. As always he is gracious and generous in acknowledgements and called upon Iwalani Herrod to present me with a precious maile lei as he told the story of how EKK came to be thirty years old; it was a story in a nutshell but important for everyone who was new to EKK. Each week many new faces show up as they indicate in their sign up sheet that they heard about EKK “in church, from the hotel maid, from our favorite hotel concierge Jane Kiilau, from the school librarian, from a lady on the airplane, and from the ‘Thirty Years of EKK’ window display in the Lihu’e airport.” Even before they set foot on the island, visitors are ready to experience one of Kaua’i’s little cultural gems and worst kept secret. For two hours they packed it all in with audience singing, ukulele circle showing off the songs they learned from Nathan and from Puna Dawson. Nathan’s song was inspired by his “best ever” trip to Bondensee, Germany and captured the essence of a ten-day tour in a song about the first two days. It was fun to hear their impression of the wonderful German hospitality which they did not expect but received. They even introduced some of their hosts from Germany who were present at EKK. There is something wonderful about a whole auditorium of over 500 voices singing a song together. Puna Dawson’s wonderfully melodic song about Koke’e called Aka Aka Awa was the product of the GIAC-sponsored Koke’e Songwriters Camp and the way that Kenneth Makuakane taught them to write a song with random numbers. I tried the same but my song did not turn out anything even close to Puna’s. Maybe it was just the way her beautiful voice made the song come alive. Whatever her magic, she really showed that she has it. Doric Yaris whose “little hula workshop” expanded into the largest hula lesson in one corner of the ballroom. We had to move two whole rows of chairs out of the way and it was still too crowded for the nearly 75 dancers who went up to learn the hula; it was a song from Niihau about picking the Kahelelani shells and dancing with lovely lei pupu sung by Kaui Kitashima.The big surprise was that Doric joined the hula dancers in an unexpected demonstration of hula. After the hula he was calling out “oxygen! oxygen!” but he showed that he still had the “ami” in his hula moves. Maka Herrod represented his own halau by dancing Ku’uhoa; he was joined by Lady Ipo Kahauna’ele and his lovely wife Iwalani. Maka is always a whole show in himself, especially when he dances the hula, but you could tell from the shouts that the audience was loving it. Recognizing all the kumu hulas on the island by calling up dancers to represent their halau was a first time happening and it was truly wonderful to see so many dancers, each with their own halau style, dancing Hanalei Moon to the beautiful vocals of Sarah Peters. During the second half, each Kumu had their halau share their dances. Jan Ken Po by one rep from each halau determined which Kumu Hula presented first. What a dazzling show of talent followed. Hula were coming at you fast and furious with some halau doing tag team on some of the dances just so they could fit their program into the allotted time. Maka’s dancers danced Lei Hulu which was a gift from Nathan to Paulette for the gift of a lei hulu which was presented to Nathan. Special guest Lady Ipo accompanied by her first cousin Kaui Kitashima sang Teresa Bright’s U’e’he Ami and Slide which Teresa composed on a napkin in Tahiti Nui decades ago. Doric’s dancers, always looking spiffy in their hula outfits, danced Lei Ho’oheno by Kainani Kahaunaele and Hokule’a. Nathan’s kupuna dancers in blue and purple holoku are always a treat. His surprise was his secret weapon guest from O’ahu, his lovely sister, who stole the show with her beauty and grace when they traveled to Europe and stole the show this evening. was the perfect last group as their hula, Perfection of Peace, reined in all the excitement and hullabaloo into a quiet and introspective appreciation of how hula can bring people from all over the world into one unified community. That was the feeling as the evening, all to soon, wound down…we all shared a feeling of community. That is what Kanikapila is all about.